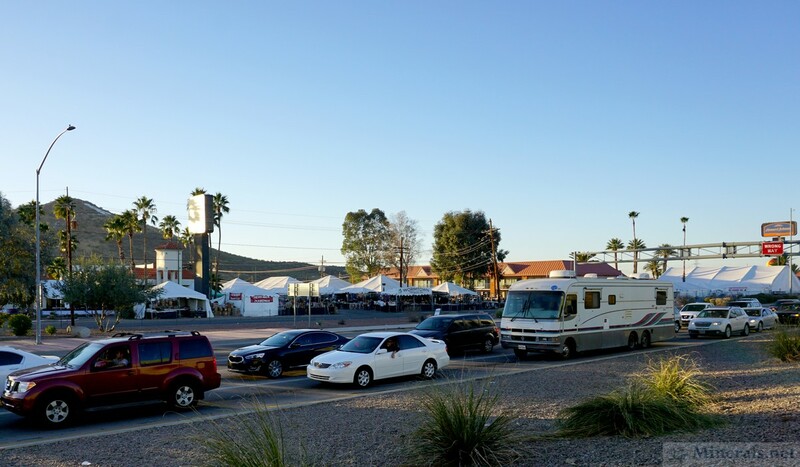 Along the western side of the I-10 Freeway, directly south of downtown, lies a cluster of shows that stretch over several motels. 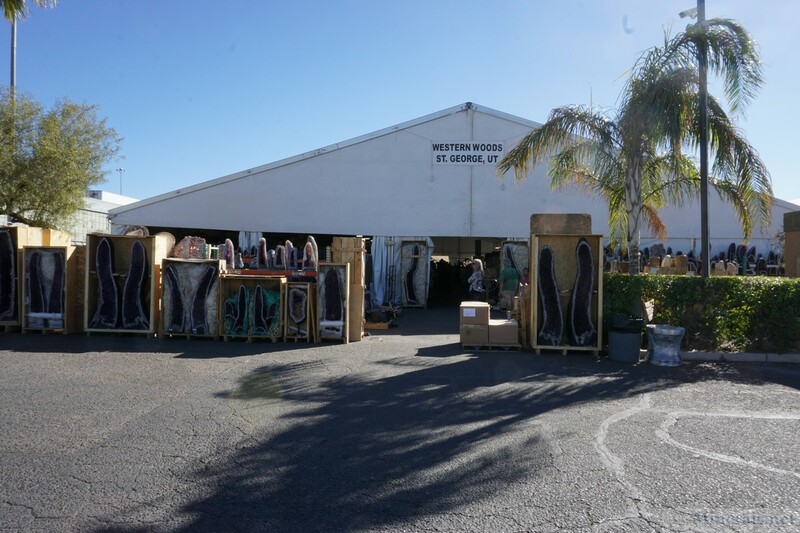 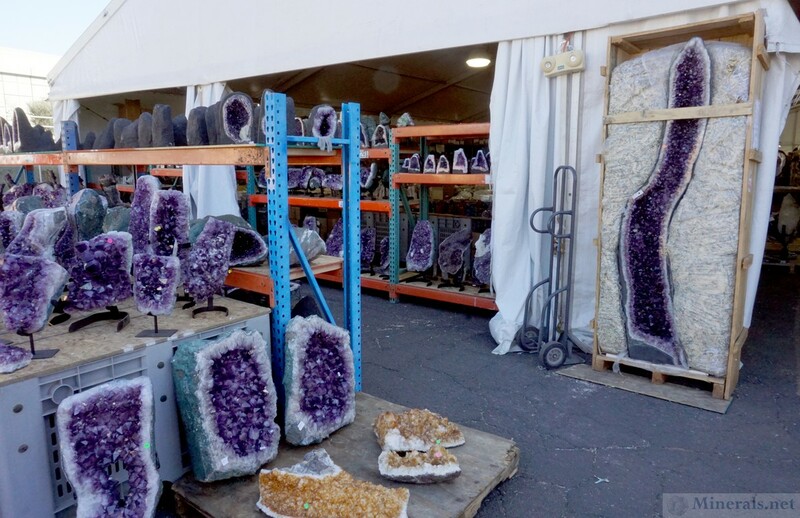 Dealers sell their mineral and gemstone goods out of their motel rooms and in tents large and small throughout the motel properties. 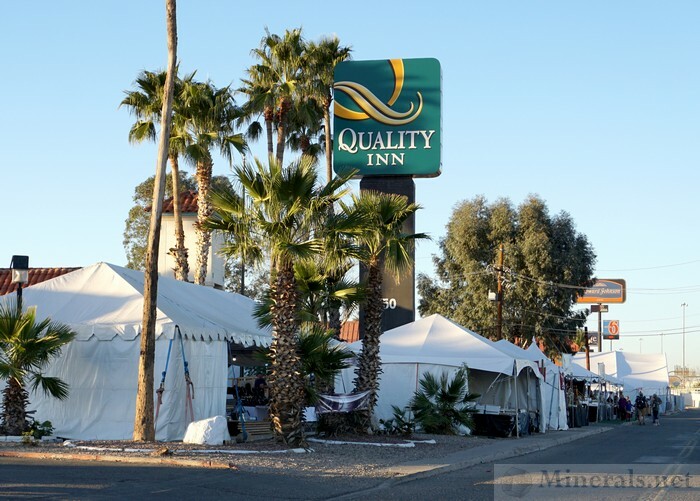 The motels include the Quality Inn, the Howard Johnson, and the Travelodge. Many of the dealers are foreign, with a large proportion of them being Brazilian. The density of dealers and sheer number of sellers at this location is truly staggering. 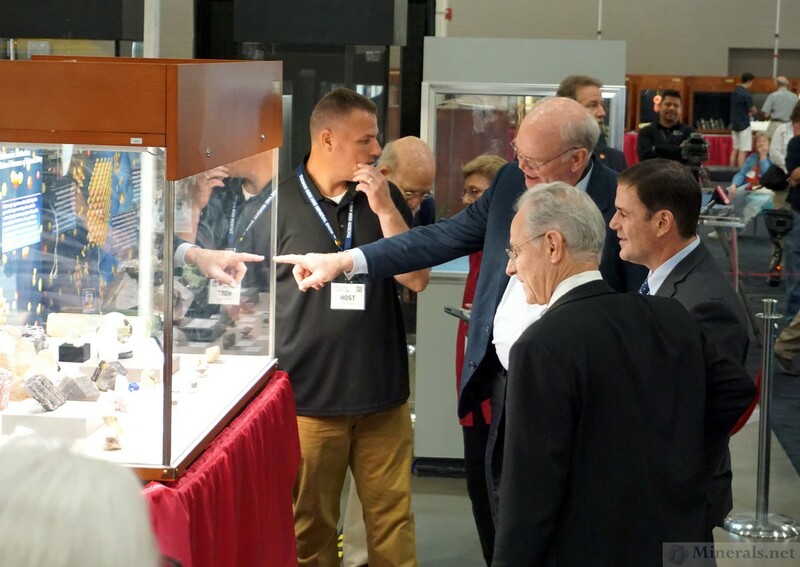 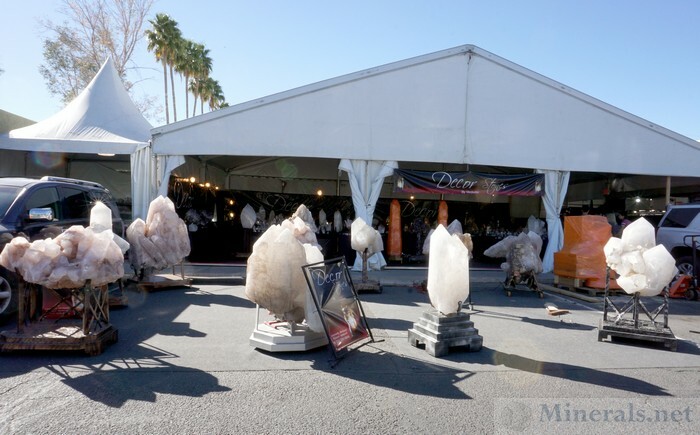 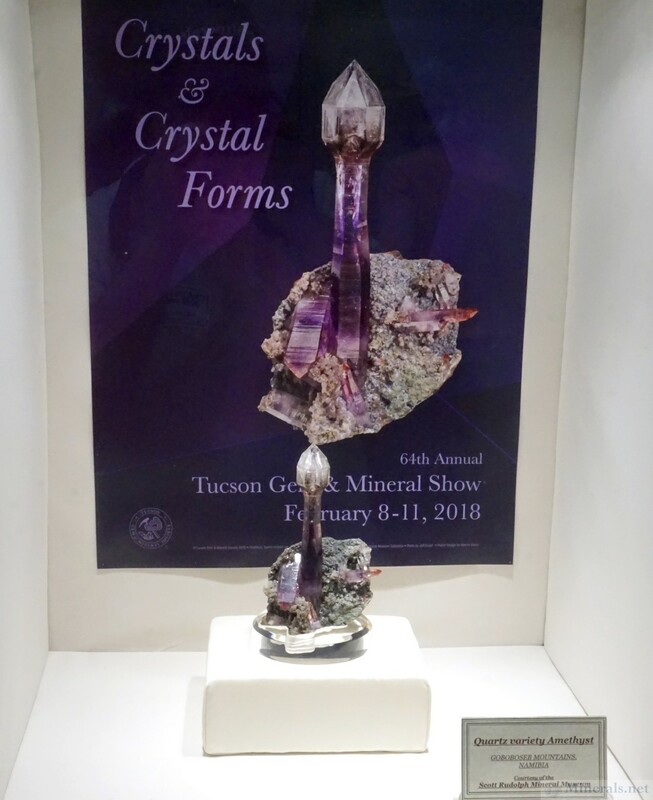 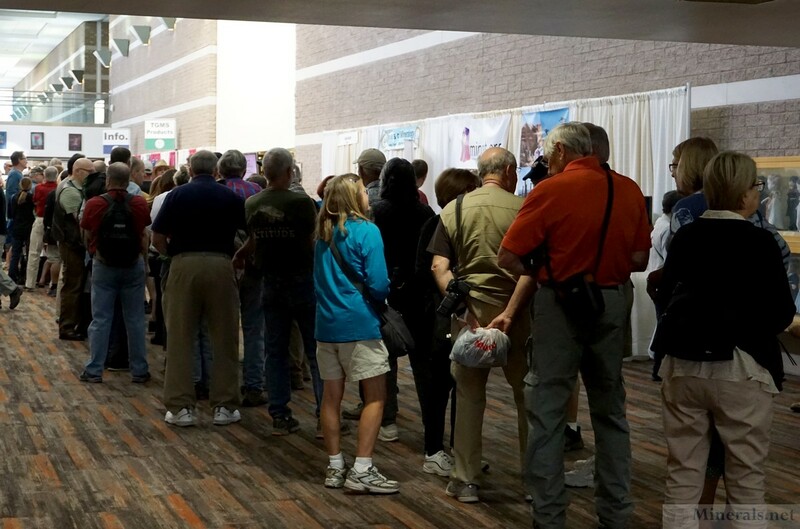 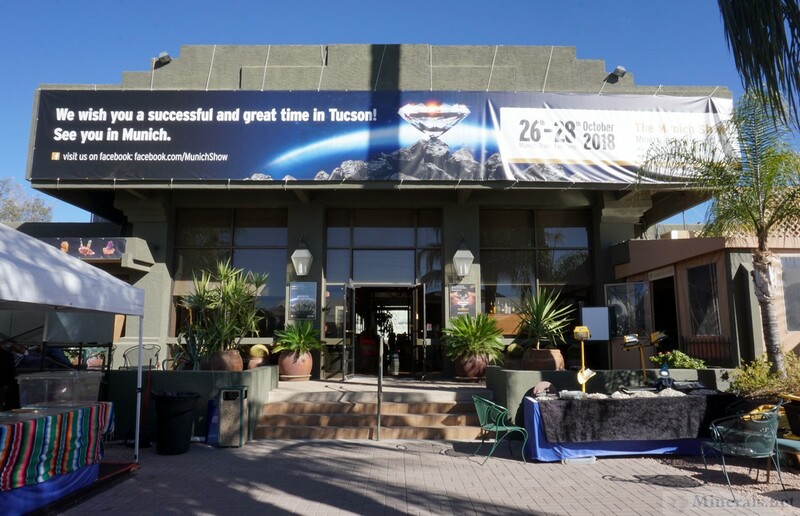 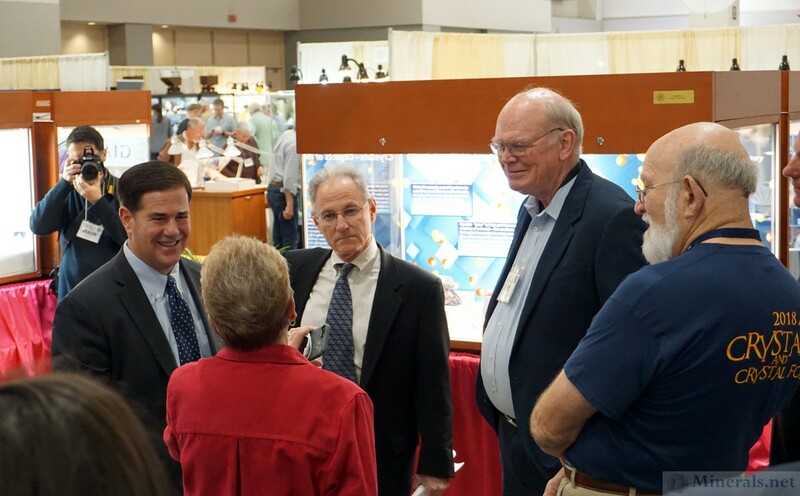 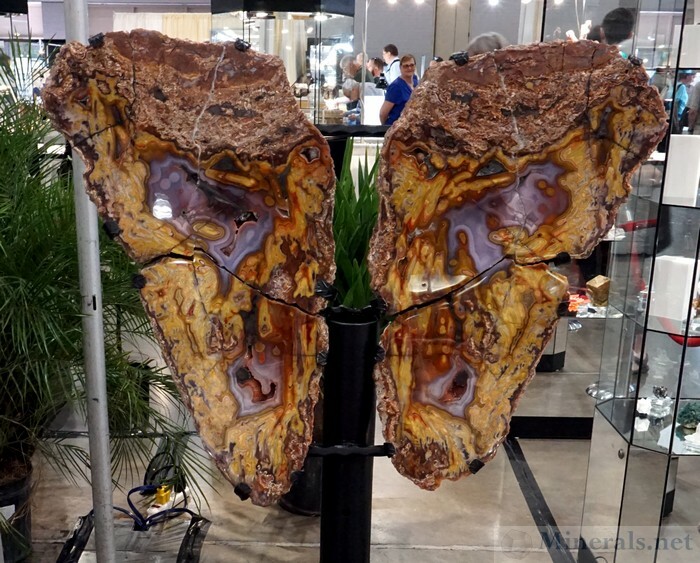 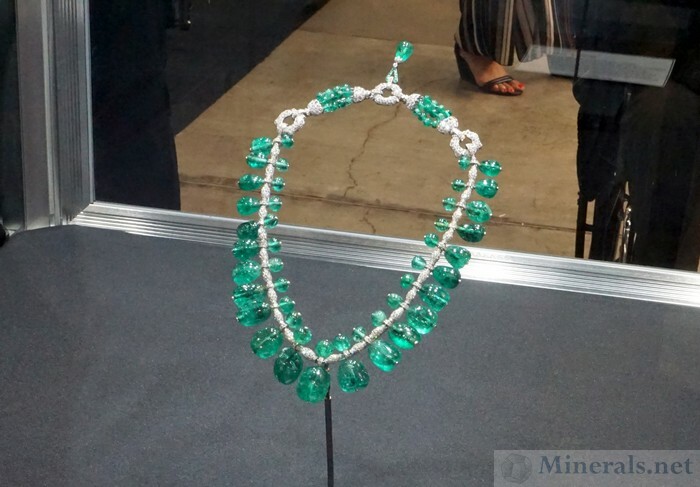 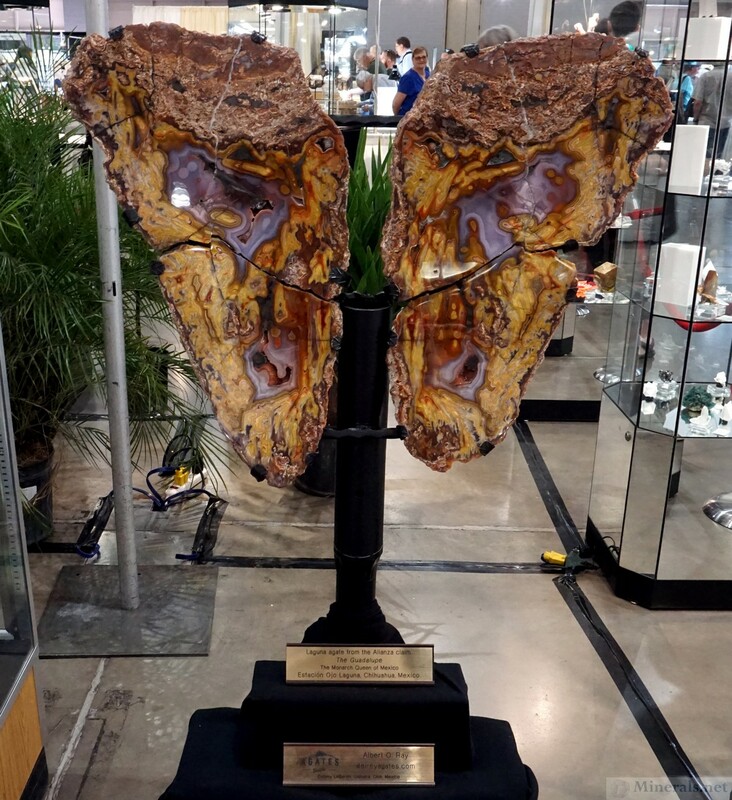 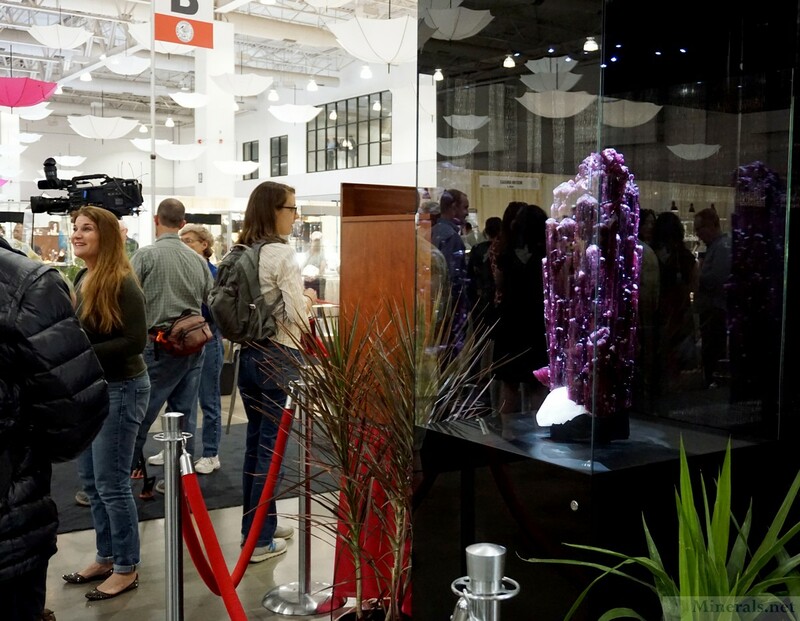 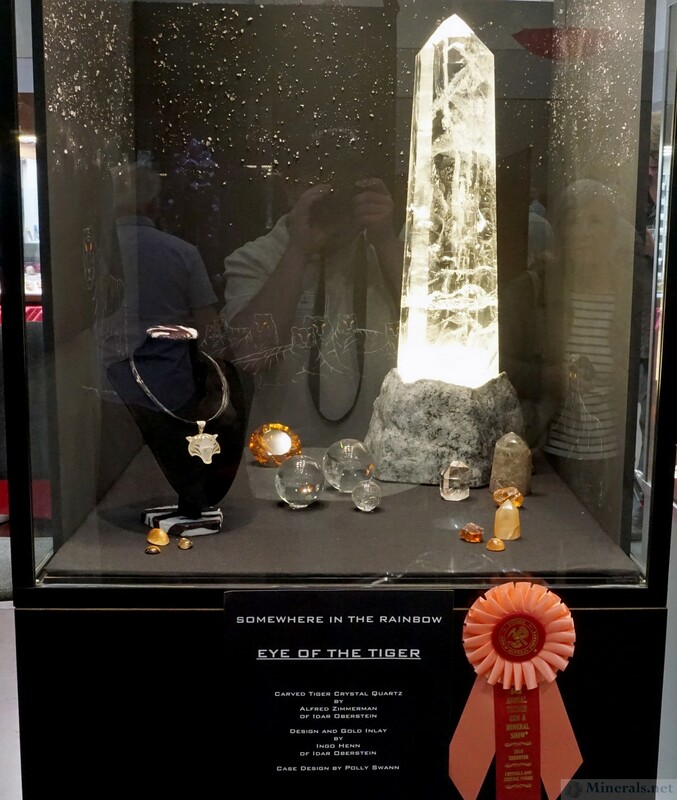 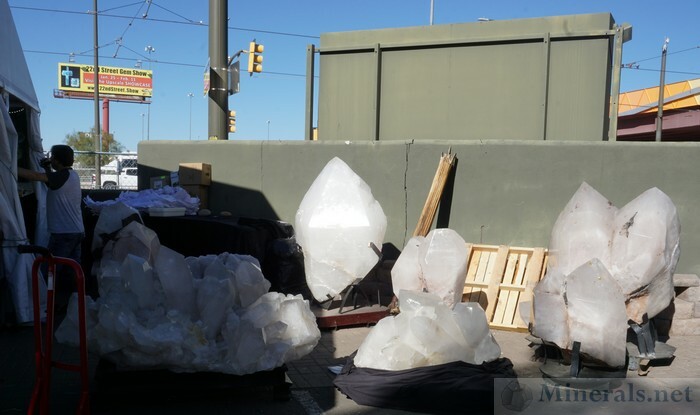 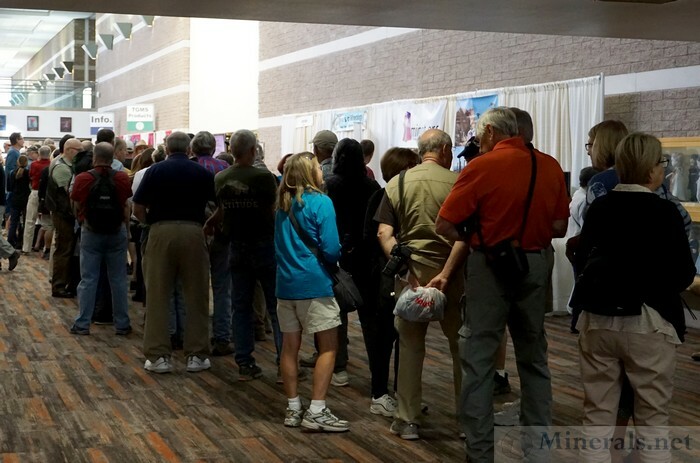 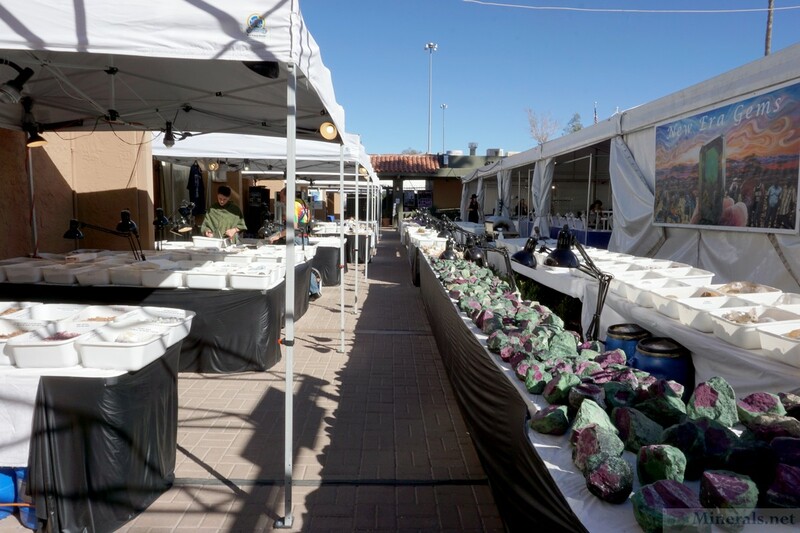 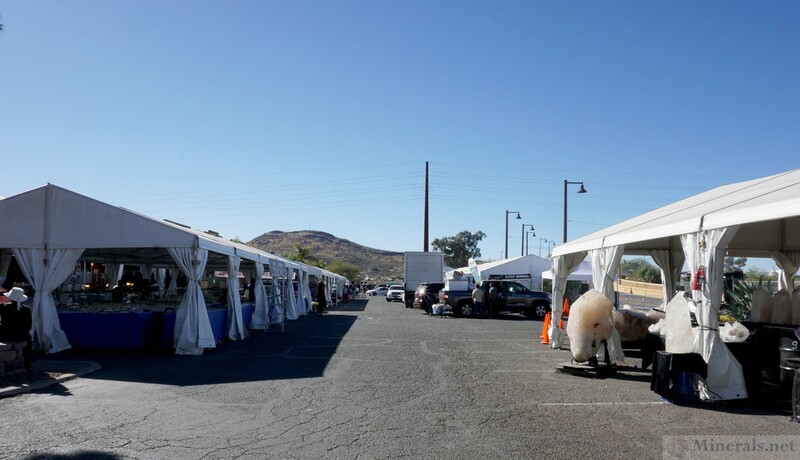 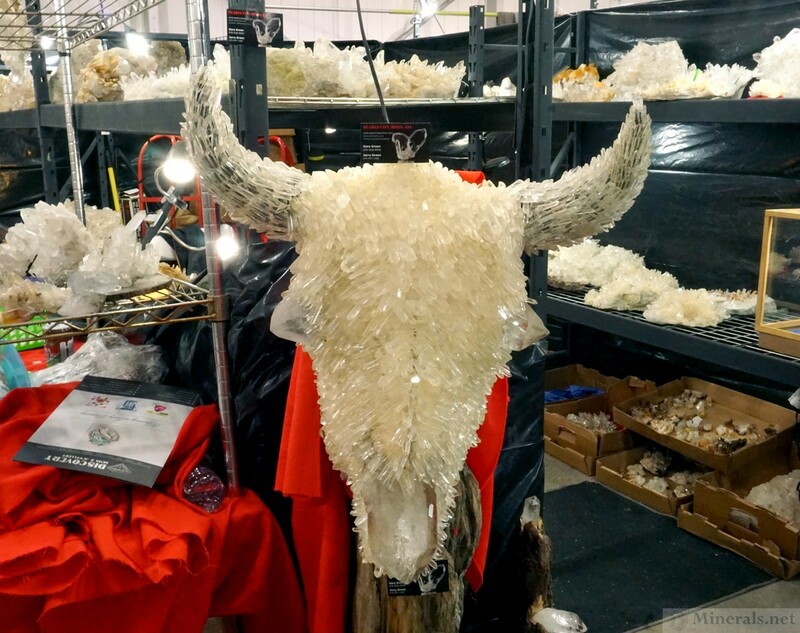 The 22nd Street Show is another important Tucson mineral and gemstone event. 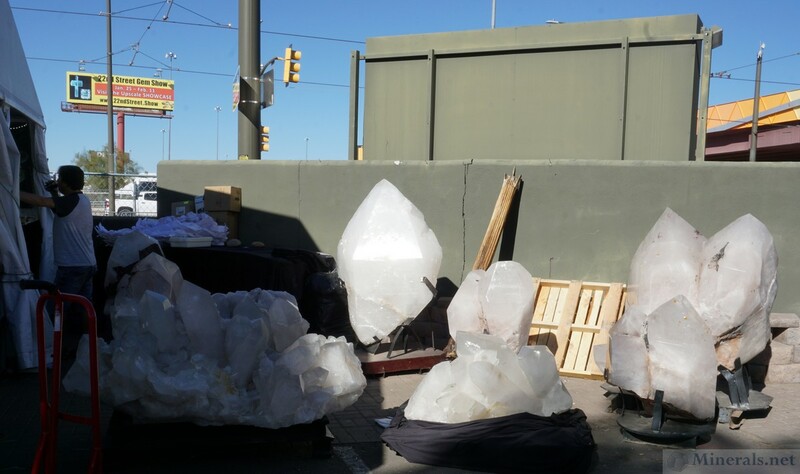 It takes place on the eastern side of I-10, directly south of downtown. It is entirely indoors, in a giant tent that seems to increase in size every year. 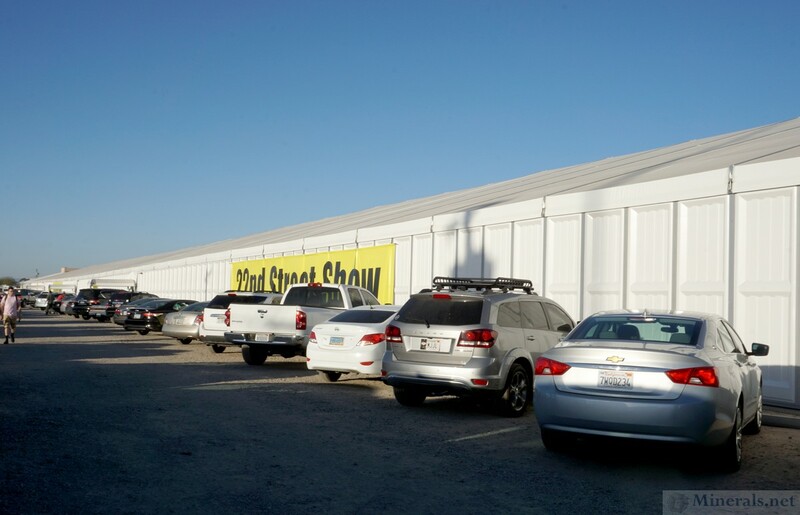 In fact, a new satellite tent was added this year, called the "Showcase." 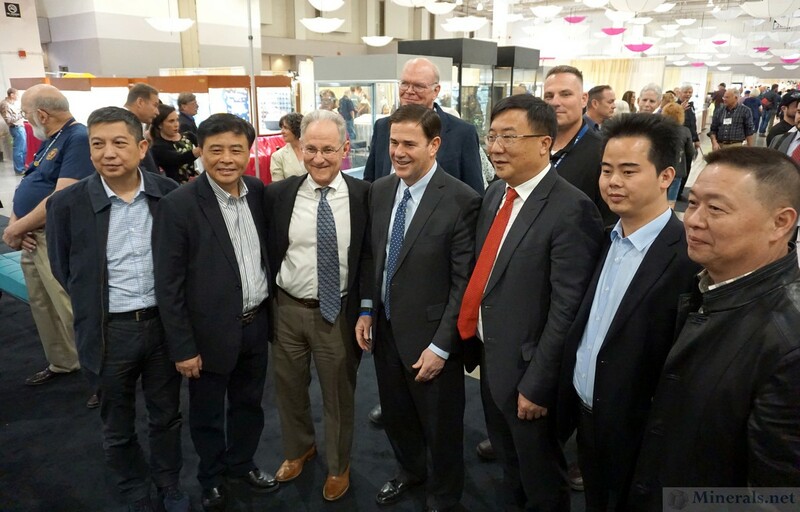 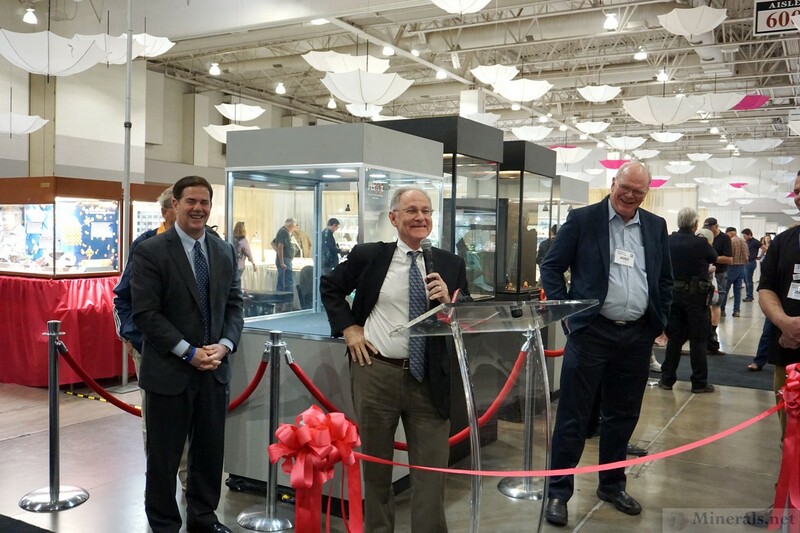 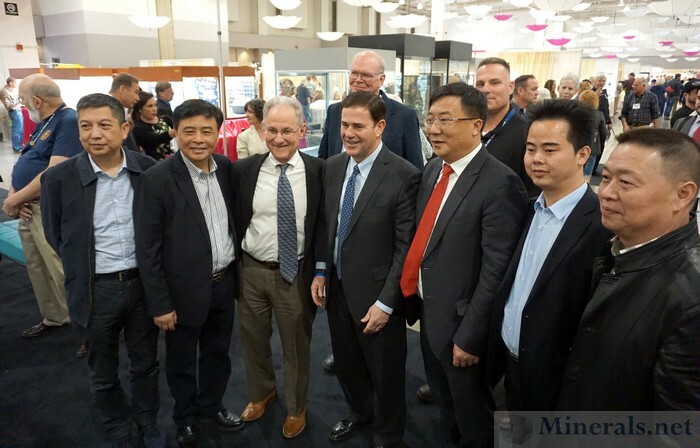 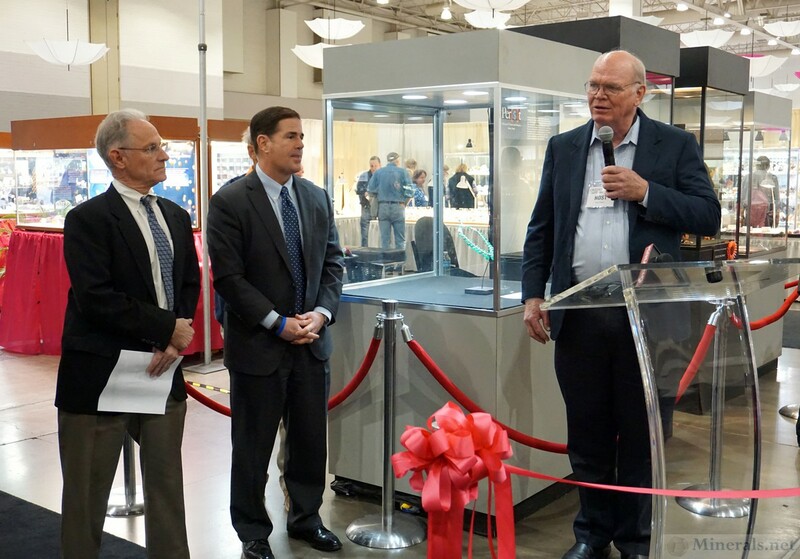 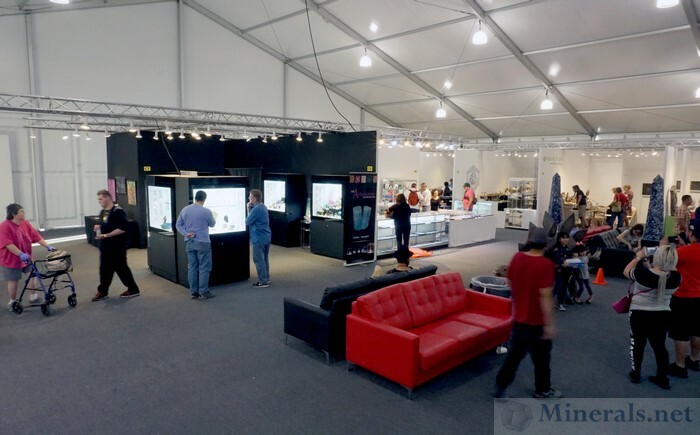 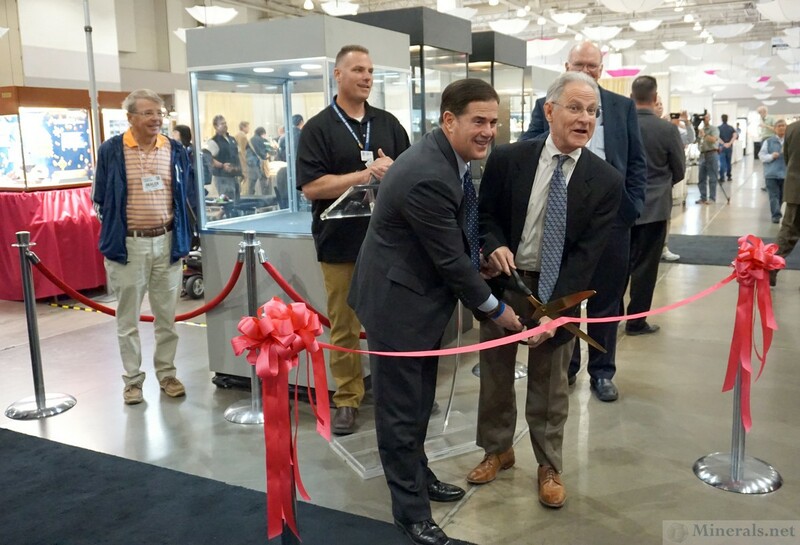 This new Showcase tent caters to higher-end dealers and more exclusive customers. 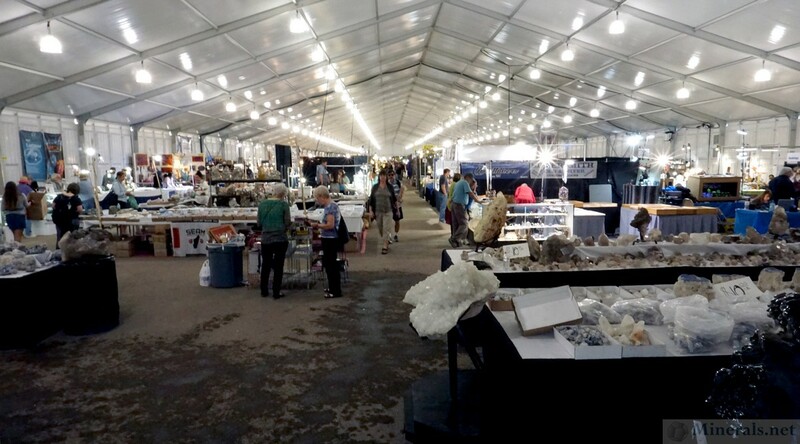 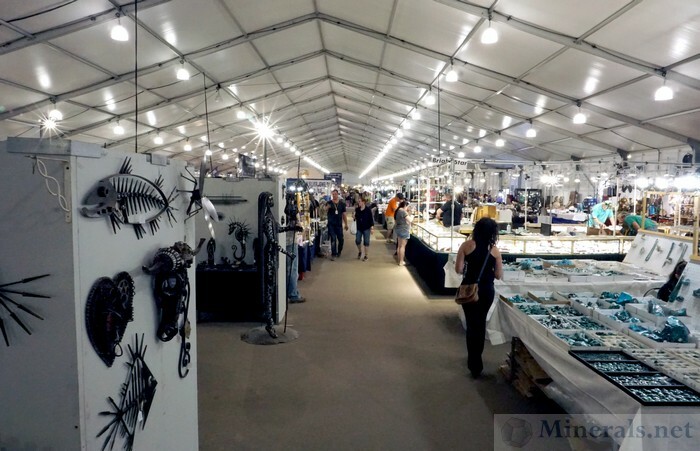 The main large tent had the usual dealers of all types, including minerals, gemstones, jewelry, fossils, and decorative rocks. 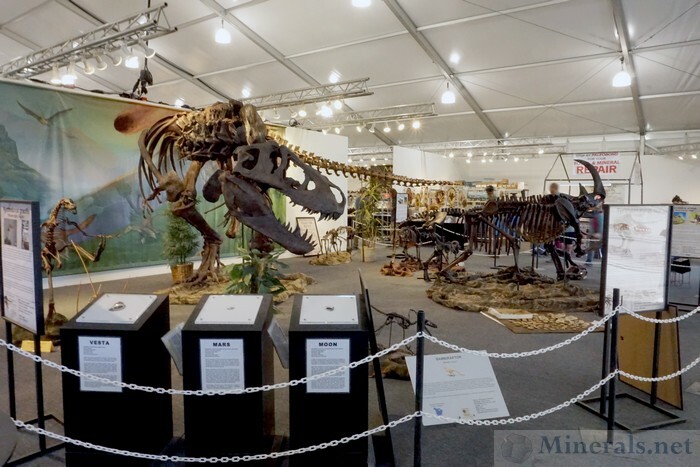 The new Showcase tent featured some interesting public exhibits, including large dinosaurs and rocks from the Moon, Mars, and Vesta. 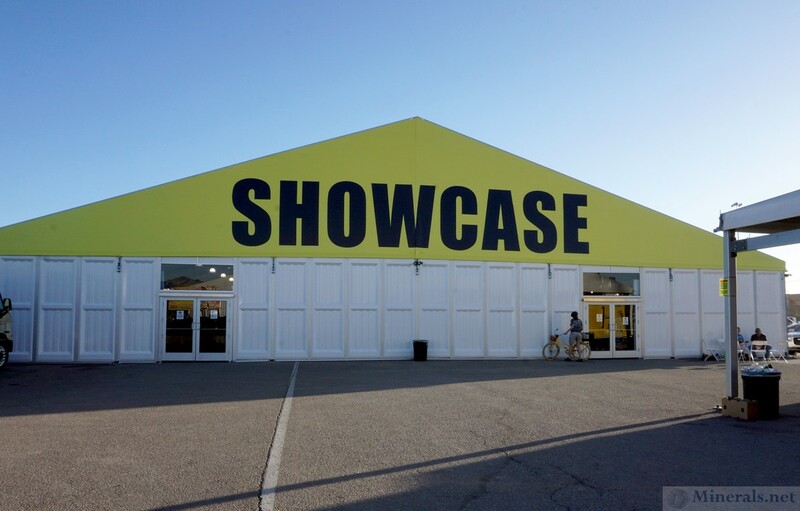 The Showcase also had a more upscale look and feel, with carpeted floors, solid white dividers, and good lighting. 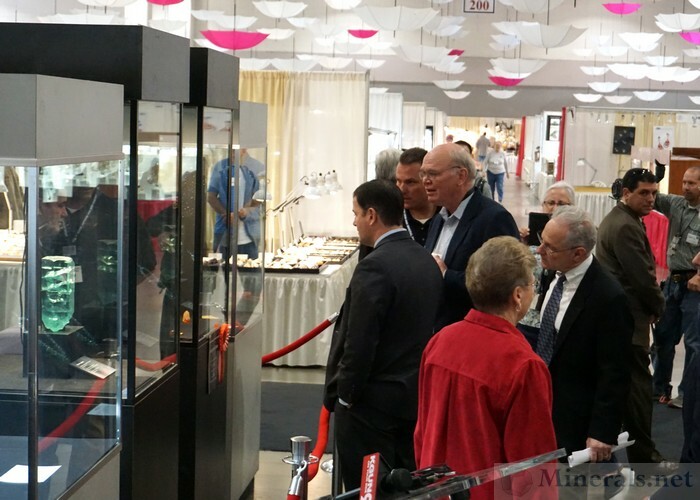 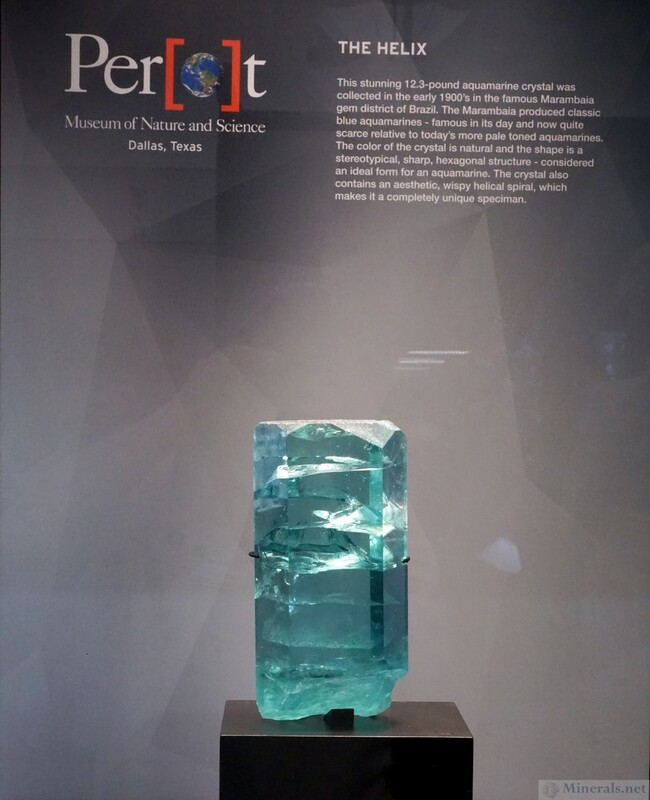 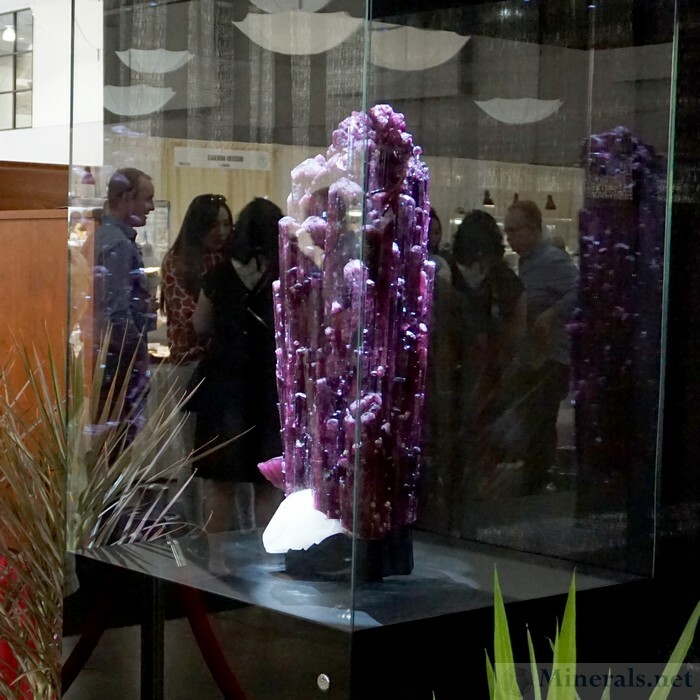 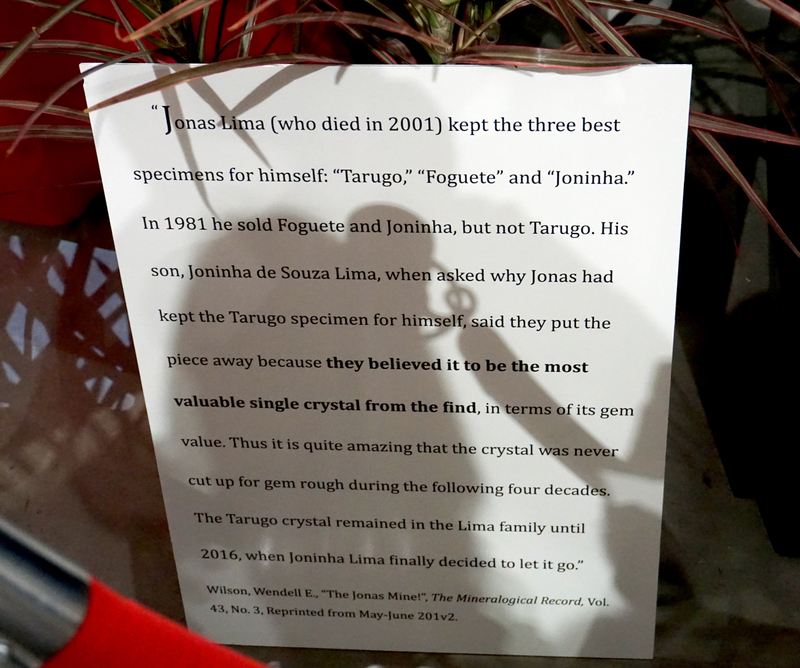 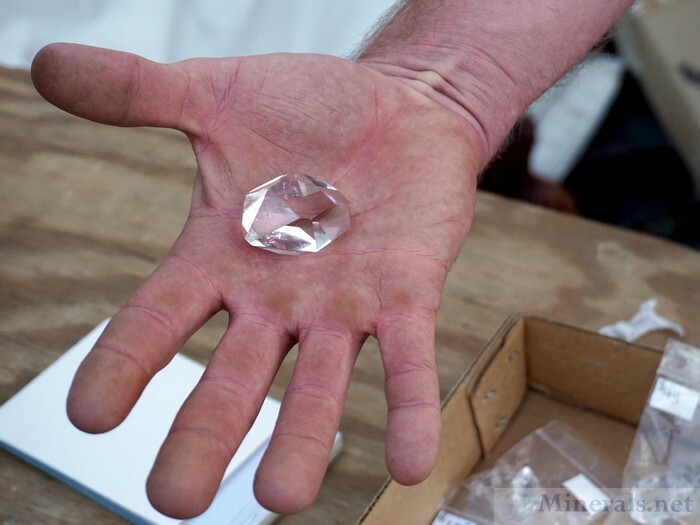 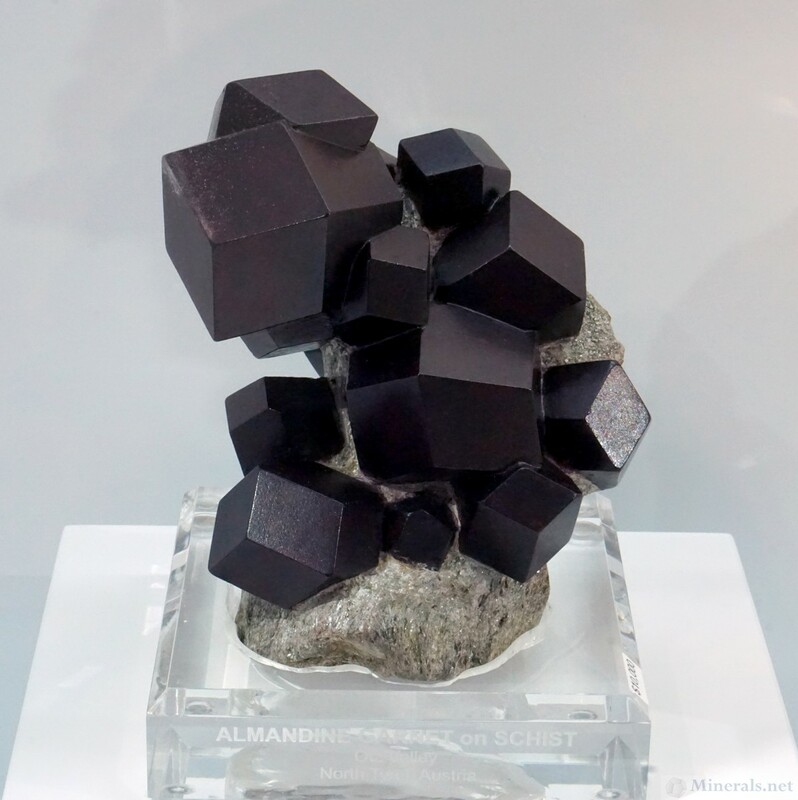 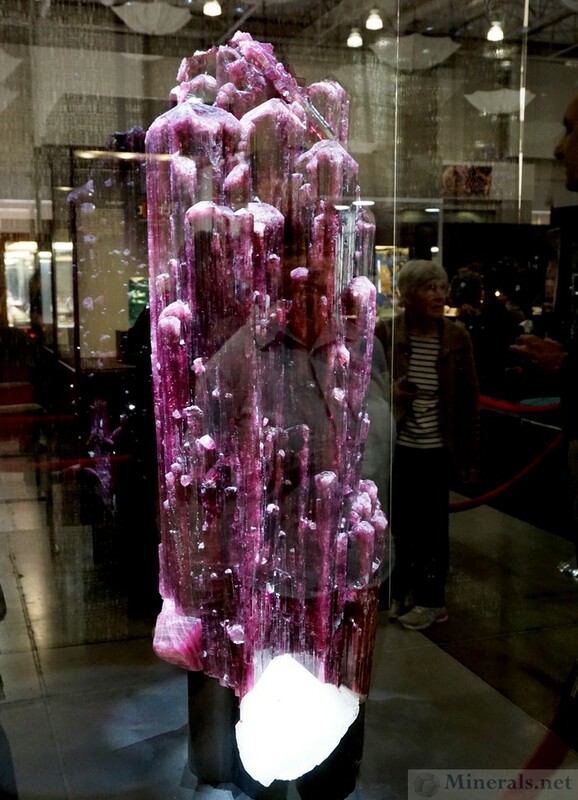 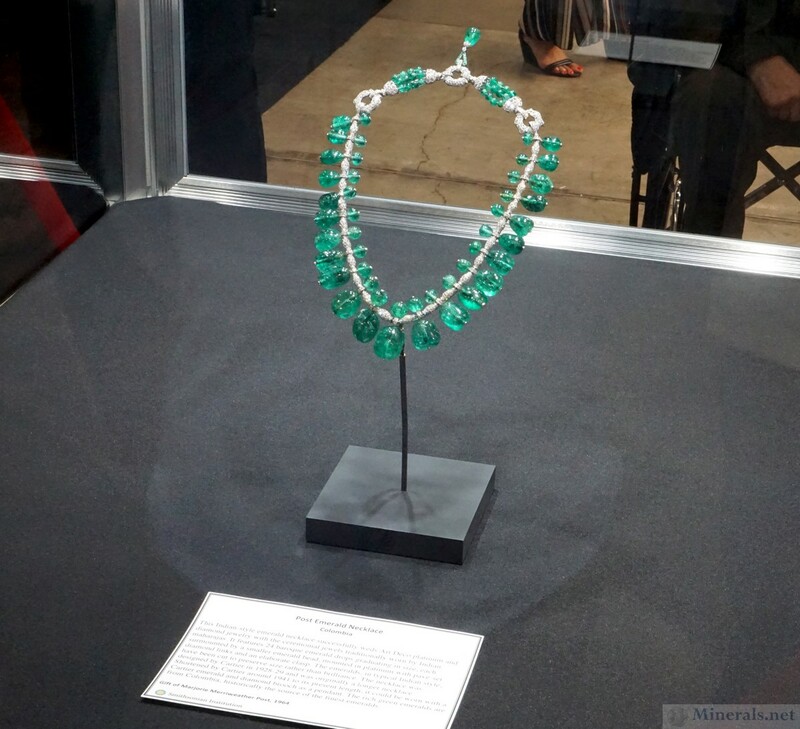 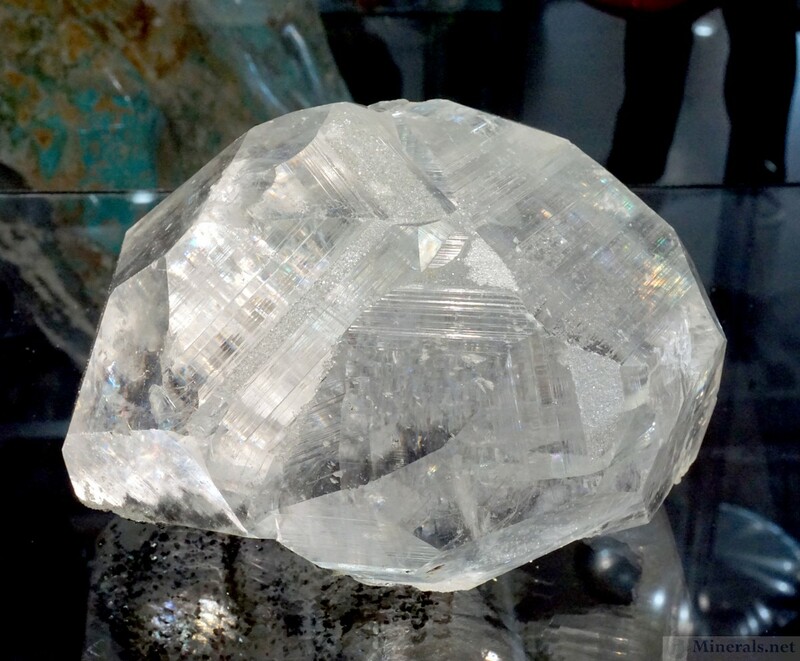 The signature dealer of the Showcase was the Arkenstone, with several impressive displays of attractive material. 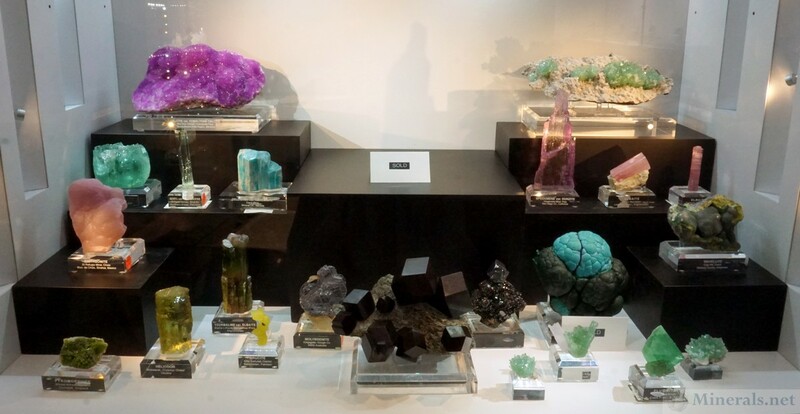 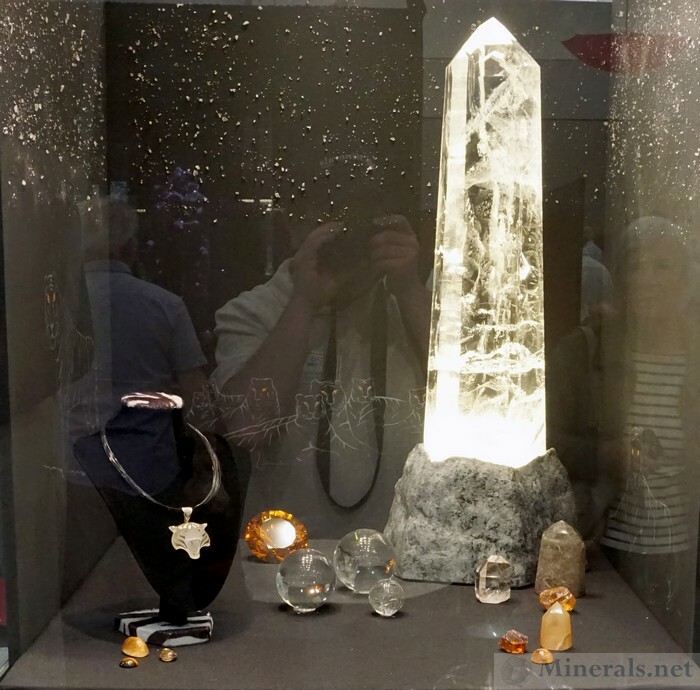 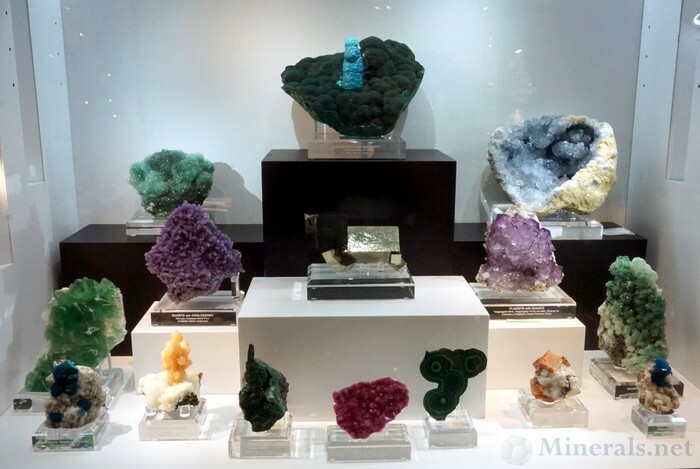 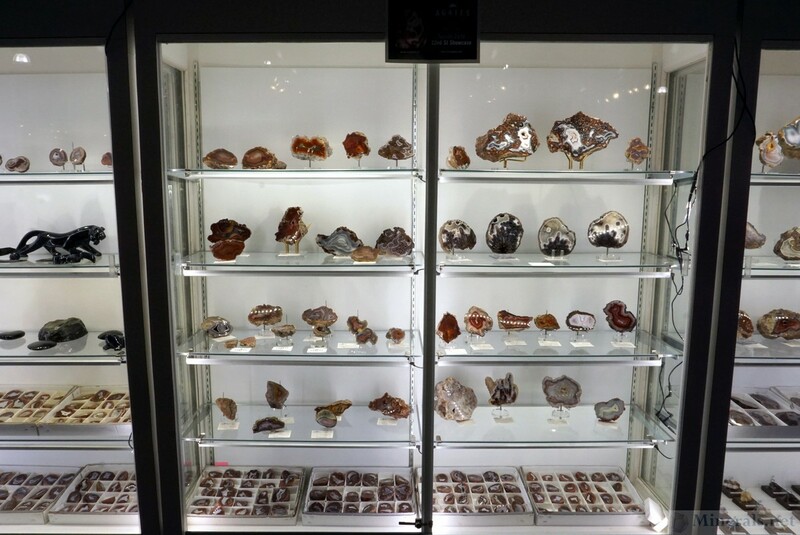 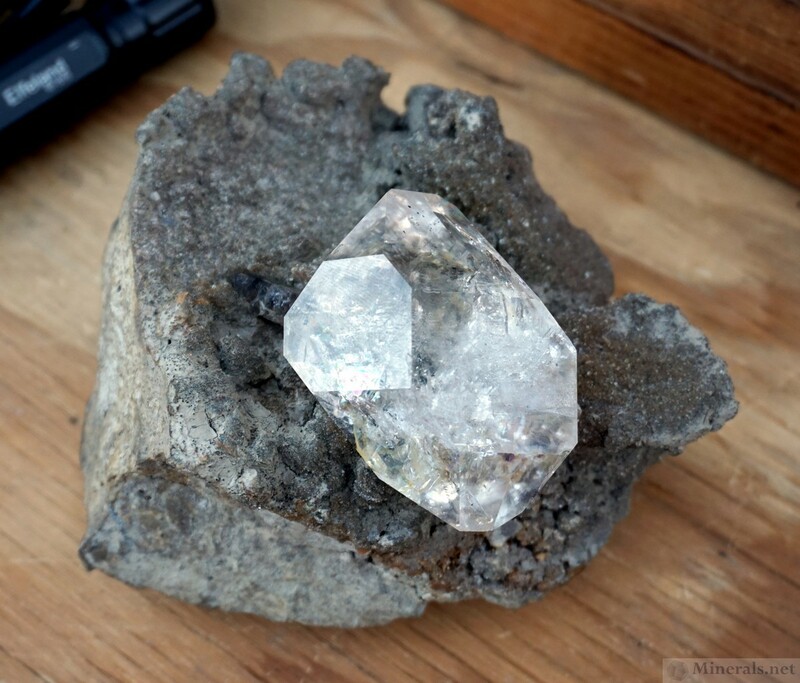 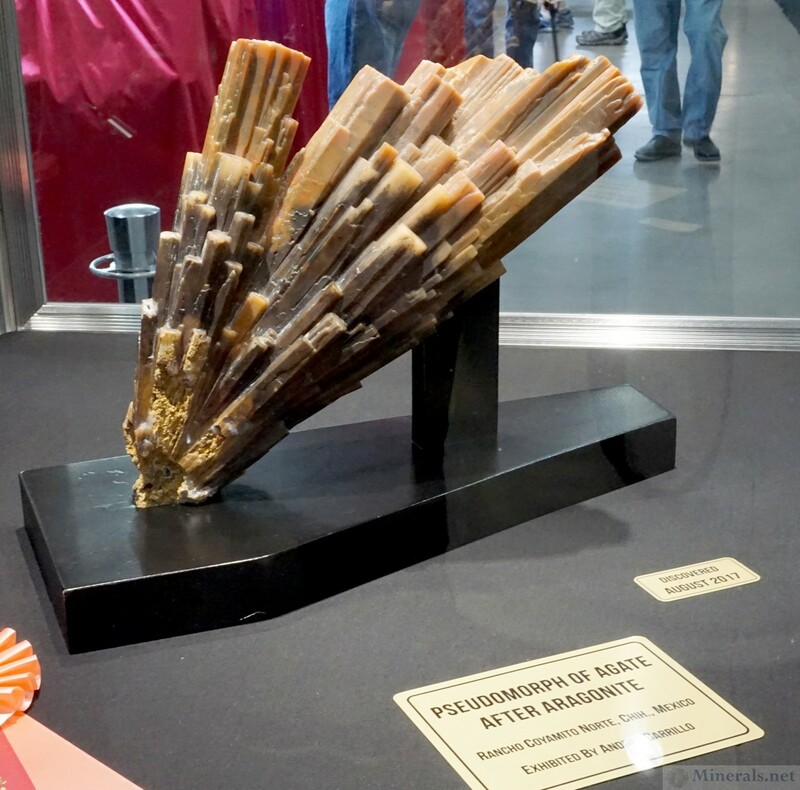 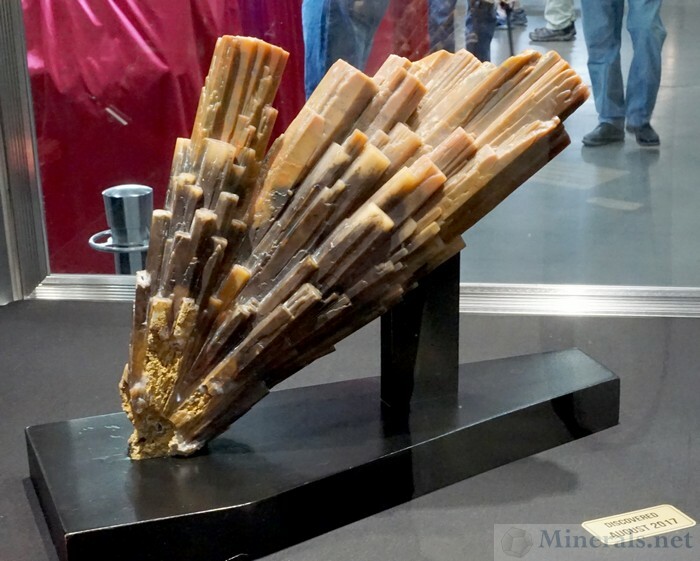 We were able to get some general photos of the show, as well as some from the new Showcase tent, with special focus on some of the minerals and cases in the Arkenstone booth. 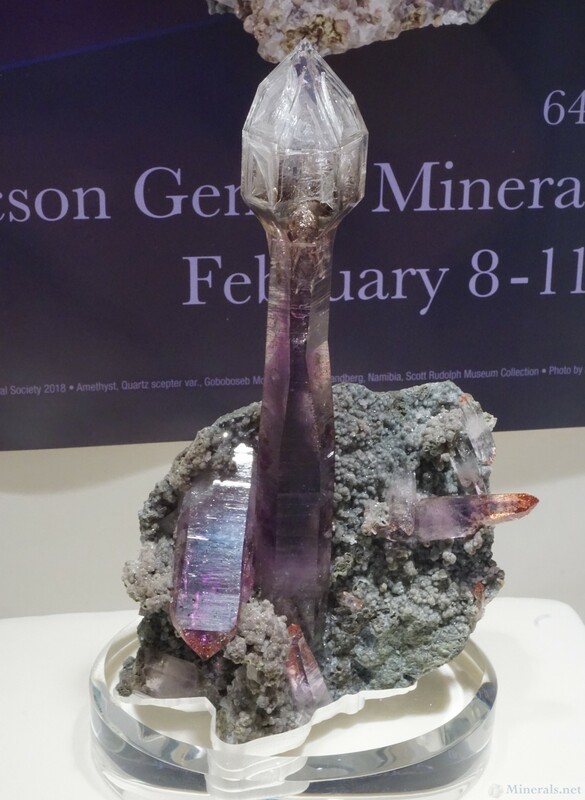 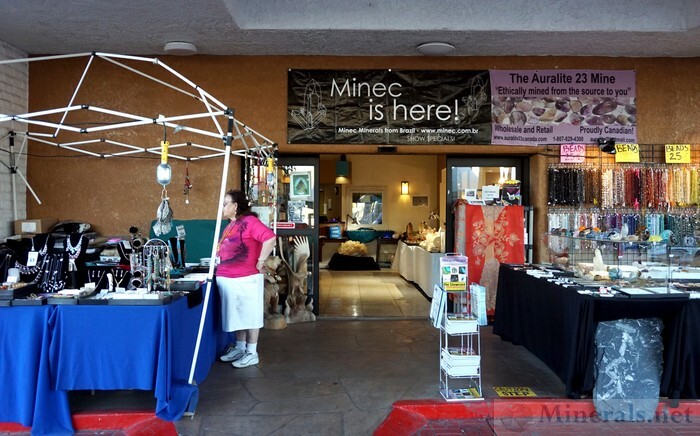 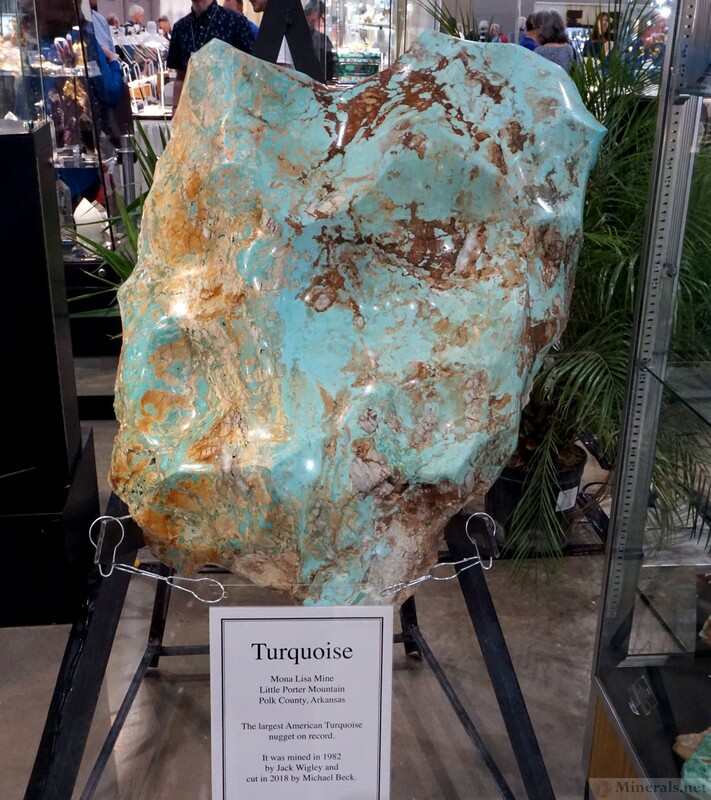 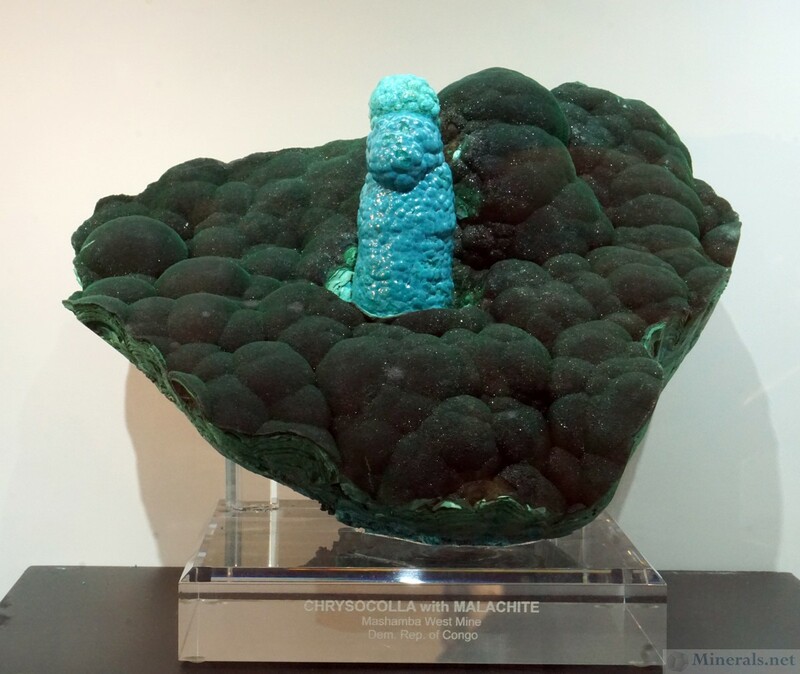 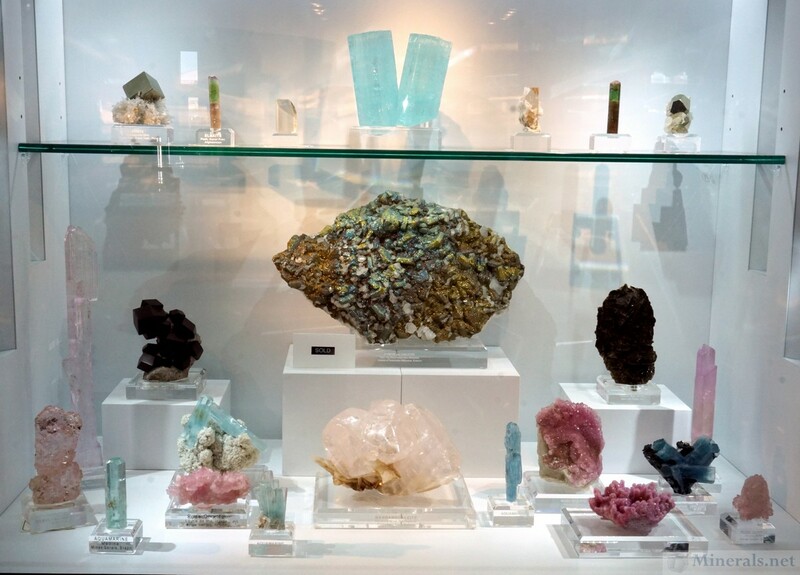 The Pueblo Gem & Mineral Show takes place at the Riverpark Inn, and is an important part of the Tucson mineral scene. 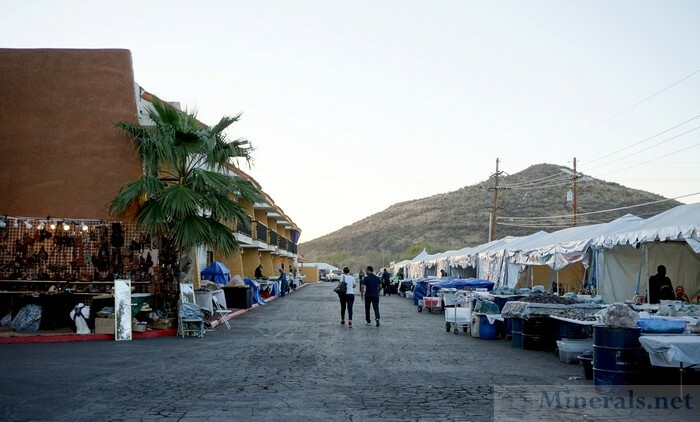 It is a sprawling show, with many dealers selling from their hotel room as well as the dozens of makeshift tents that dot the property during the show. This show has a wide variety of dealers. 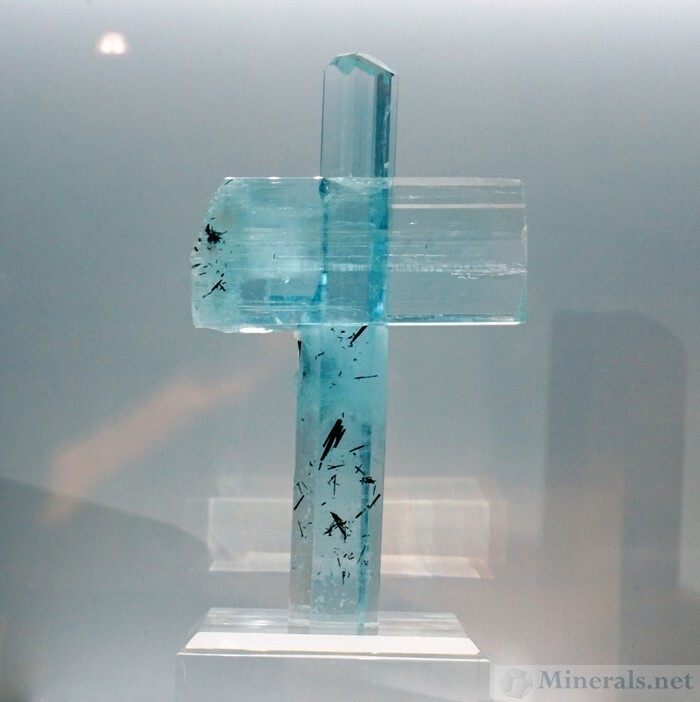 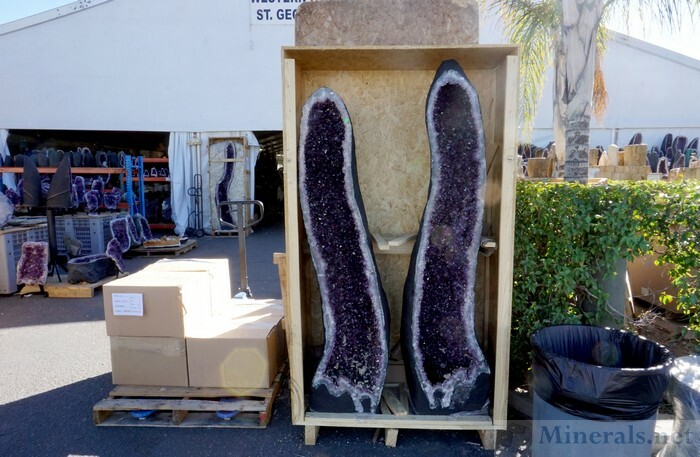 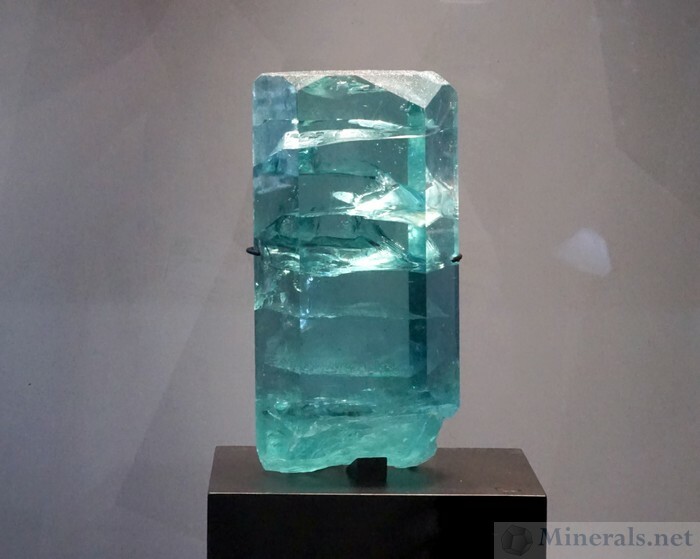 There are many mineral dealers, including a growing number of fine mineral dealers, but there is also a very strong presence of gemstone and jewelry dealers. 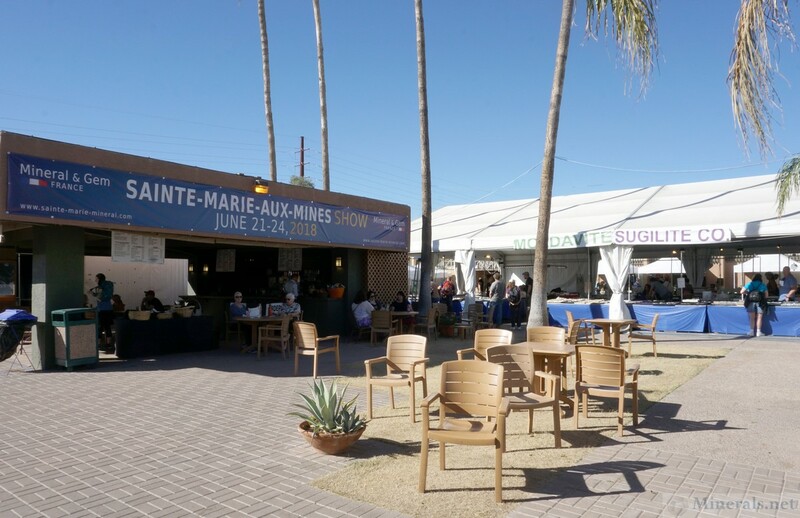 This show is very enjoyable due to its laid-back atmosphere. 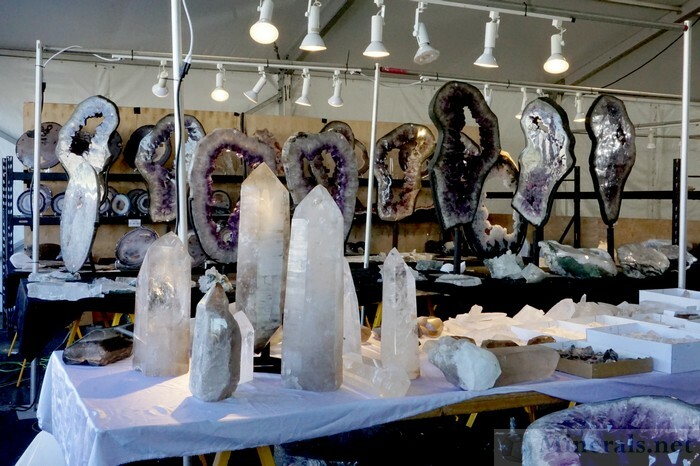 Always present are gigantic Quartz and Amethyst crystals, which make an incredible site to see.